IPEVO Cushi iPad Stand – Because Your Tablet Deserves To Be Comfortable Too! | OhGizmo! IPEVO Cushi iPad Stand – Because Your Tablet Deserves To Be Comfortable Too! We don’t have to tell you that when it comes to finding a stand for your iPad, there are literally thousands and thousands of options on the market. But when you’re trying to decide on which one to go with, do you ever take your tablet’s feelings into consideration? Sure, a given stand might prop it up at the perfect angle, but will your iPad feel comfortable sitting in it? Sadly most people probably don’t even consider that, and so wouldn’t realize how comfortable the Cushi stand from IPEVO could be for their device. It’s made from soft foam covered with 100% cotton denim which can be easily removed for washing. 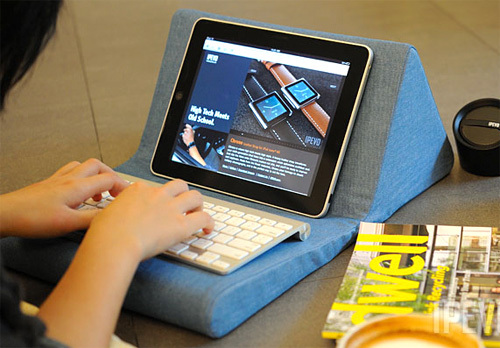 And it’s only available in one color which they refer to as “Steve’s Blue Jeans.” The generic design of the Cushi lets you use your tablet in either portrait or landscape mode, and an equally padded flap can be flipped around and used as a keyboard tray, complete with a padded wrist support. At $34.95 it’s not particularly cheap or expensive, and while it doesn’t look too convenient to travel with, it could probably double as a semi-usable pillow in a pinch.